Looks like Samsung fingerprint scanner might go corporate in the near future if what we just learnt a few minutes ago is anything to go by. The Galaxy S5 launched earlier in the year came with a fingerprint scanner that works from the screen for security purposes. 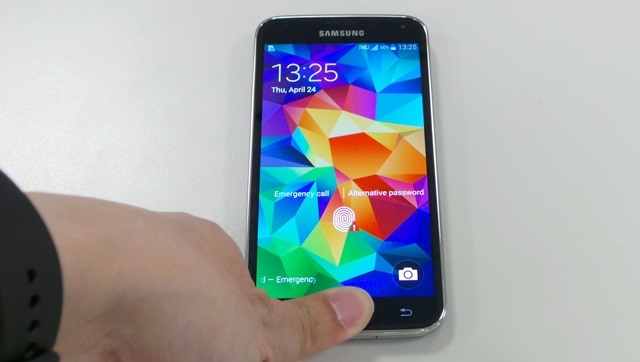 Android Planet has it that Dutch Police are going to use the fingerprint scanner on the Galaxy S5 for law enforcement. This goes beyond just saving your single finger print on your phone to secure device or make payments with. They are going to use them for law enforcement and have already ordered 35,000 units of the Galaxy S5. The Galaxy S5 devices will replace Blackberry devices already in use by the Holland police. The Holland police is said to plan to use the fingerprint scanner to identify people outside of the usual ID display. This essentially means that the national database will be saved onto the device in an app that utilises the fingerprint SDK by Samsung. Beyond just identifying law breakers, the app is said to also scan documents, badges and most importantly give fines. This is apparently a rumour that is yet to be confirmed by either the Dutch police or Samsung. Of course if this is true then Sammy will be quite ahead in proving that their implementation of the fingerprint scanner just went miles ahead of Apple who did it first. Samsung KNOX also seems to be getting the better of Blackberry security each and every time and it has seen some progress in making inroads to government business.